Over the past three weeks, Nicole Cathcart and I have discussed various individual elements of Lifeline, a concept for redesigning emergency response. Today we’ll conclude with a summary of how the elements of Lifeline work together to transform disaster response and recovery. •	Life Line – a citizen-facing application that employs social triage logic to prioritize rescue operations and enable peer-to-peer assists. 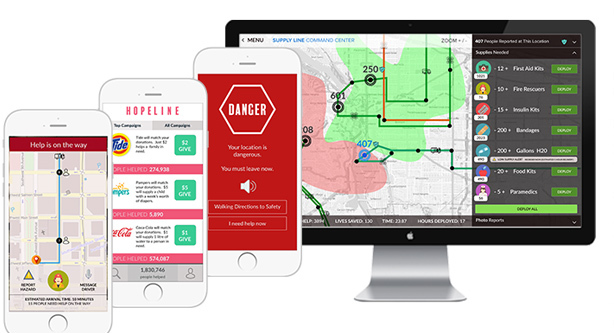 •	Response Line – a first responder application that organizes missions, provides real-time route safety and hazard information, and enables communications with citizens and emergency response professionals. •	Supply Line – a command center system providing real-time visualization and resource management tools fed from citizens and first responders. •	Hope Line – a socially verified peer-to-peer crowdfunding and corporate sponsorship system enabling direct aid to citizens. 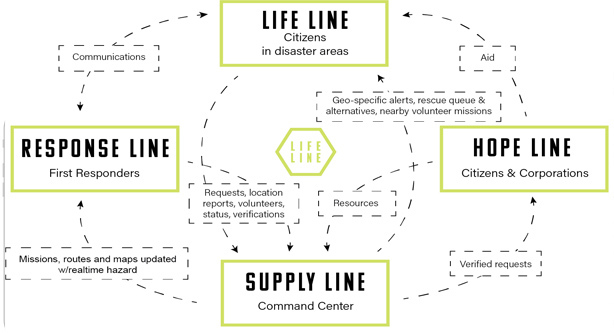 As illustrated above, Life Line, the core citizen interface during a disaster, gathers citizen requests for assistance and feeds that data to Supply Line. Life Line also allows citizens to volunteer to assist others in the event first responders are not in reach or prioritized elsewhere. Supply Line evaluates inbound requests based on priority algorithms. Those algorithms can be strengthened by citizen verifications reported from Life Line and data from first responders using the Response Line application. Supply Line gathers these inputs and optimizes mission assignments based on priority, route safety and efficiency, and then communicates the assignments to Response Line. First responders confirm mission assignments and send estimated response times back to Supply Line. Supply Line then communicates current support status to citizens and provides additional options with waze-like views illustrating pathways to designated safe zones. Citizens can also request help from nearby volunteers if they are unwilling or unable to wait for help from first responders. As resource needs are gathered from citizens and first responders via Life Line and Response Line, Supply Line manages available inventory and advertises supply gaps to Hope Line for crowdfunded and corporate sponsorship. Geolocation data, images, and social verification improve donor confidence that their donations will directly support impacted citizens. The Lifeline series represents a concept for an integrated system with the potential to redesign the way we respond and recover from disasters. It helps eliminate waste and abuse that can occur despite best intentions, and it enables more citizen heroes to emerge. 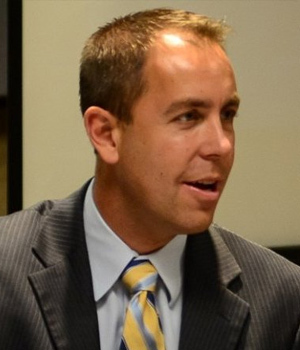 It also provides a modernization of data accuracy, speed and usability. Instead of our current fragmented disaster management capabilities, often built on legacy infrastructure, Lifeline is a powerful integrated example of redesigning this essential service. We hope by sharing Lifeline we’ve inspired you to think of ways that we could improve our disaster responsiveness and resilience as a nation. If you have ideas on how to improve on this design, make it a reality, or have ideas for a different approach, we’d love to hear from you.